I soooo look forward to breakfast. It's my absolute favorite meal of.the.day.hands.down. For as long as I can remember, every morning I would chow down 3-4 bowls of cereal. No problem. But then I grew up and realized a massive sugar crash and a 6th month pregnant looking bloated belly just wasn't worth it, no matter how incredibly delicious dried marshmallows in milk taste. Since saying goodbye to sugary cereals I've tried my fair share of favorite breakfast, such as Green Smoothies, Waffles, etc., but some days I really do miss cereal. Especially since my husband makes me buy him Reeses Pieces Cereal on a weekly basis...And he eats it in front of me. And he weighs like 110 pounds. Don't you hate him? So I knew if I was going to create my own kind of 'cereal', it had to be easy, fast, flavorful, mom and kid approved! Not to mention, full of protein! Something that will keep you full, without giving you that 10 a.m. sugar crash. 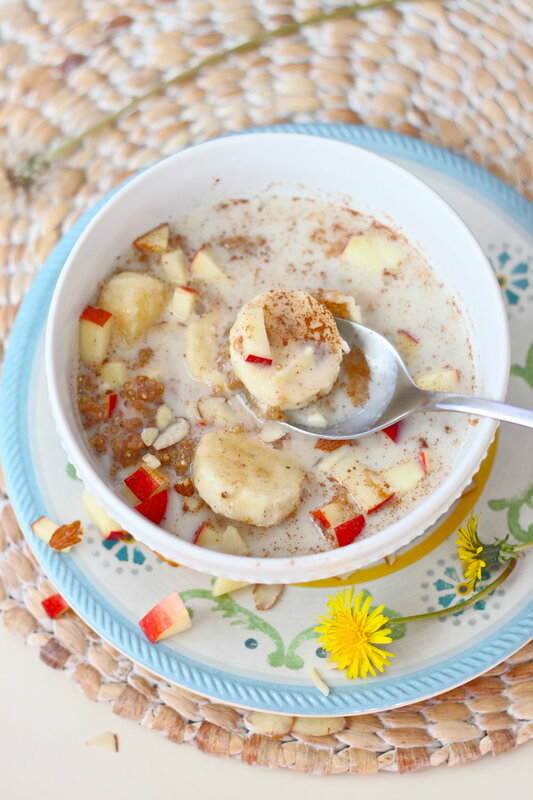 Need a quick ready made breakfast for the morning? Want something to look forward to when you wake up? This Breakfast Quinoa Bowl can either be dressed up in a cereal with cold almond milk, topped with your favorite toppings. OR you could warm it up with warm milk and toppings. OR you could mix it with greek yogurt sweetened with a little maple syrup! 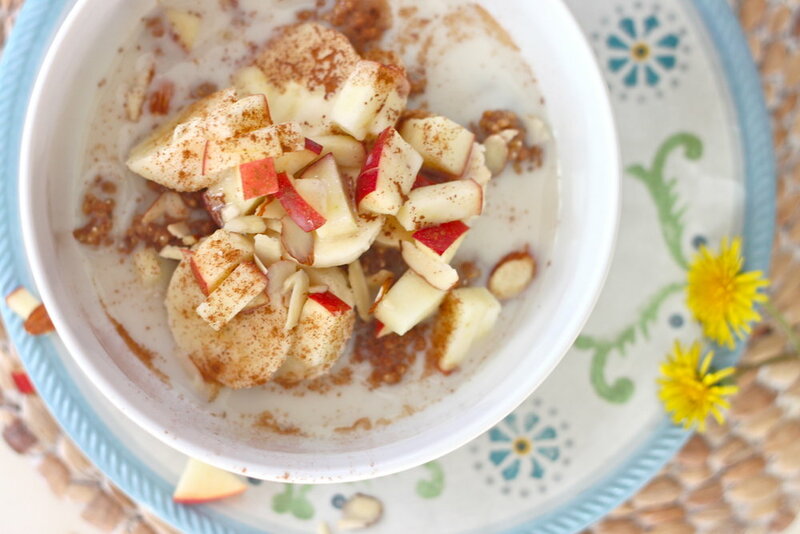 Almond milk, greek yogurt, diced apples, diced fruit, slivered almonds/nuts, extra cinnamon, maple syrup, etc. Add quinoa to a bowl, let cool a little bit, cover, and place in the fridge. Technically you don't have to let this sit in the fridge overnight, but it's nice to have a ready made breakfast for you waiting in the morning! In the morning top with cold milk, and your favorite toppings. OR you can heat up the quinoa with some added milk. 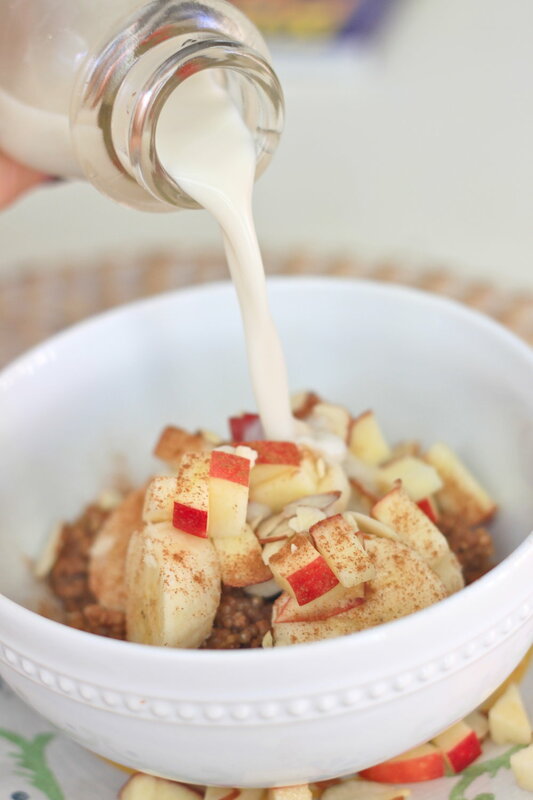 OR you can mix it with maple sweetened greek yogurt! There are so many possibilities! Maybe a drizzle of nut butter would even make this taste like...Reeses Pieces?